A national warning remains in place, with temperatures of -5 expected tonight. 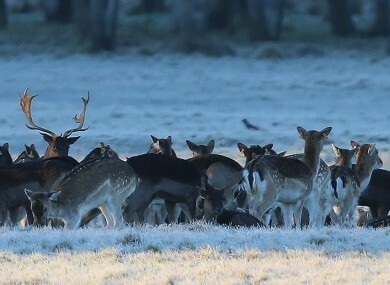 Deer in the Phoenix Park in January: a severe frost is expected tonight. TEMPERATURES WILL DROP to as low as -5 degrees tonight, as severe frost persists across Munster and much of Leinster. A cold, frosty, foggy day is in store – with a severe frost persisting across the southern half of the country, according to Met Éireann. There will be good sunshine in many parts – although less so in the northwest. Met Éireann said: “Very cold tonight with frost, and where clear skies persist the risk of icy patches. The frost will be severe over Munster, Leinster and the midlands with minima of – 2 to -5 degrees; generally patchy across Ulster under somewhat cloudier skies with minimal of 0 to 5 degrees. Transport Infrastructure Ireland have warned of low road temperatures on many motorways, including the M7, M8 and M9, all of which travel through the coldest areas. A national ‘low temperature warning’ remains in place for the whole of Munster, as well as Carlow, Kildare, Kilkenny, Laois, Wexford, Wicklow and Offaly. It is due to be lifted at 9am today. Temperatures this morning plunged to as low -6 degrees in rural areas in the southern half of the country. Email “Much of the country is waking up to very cold conditions this morning”. Feedback on “Much of the country is waking up to very cold conditions this morning”.